The day before Thanksgiving and everyone is deep in the hustle and bustle of preparing for the big traditional meal or hitting the roads to travel far and wide to get to the family table. 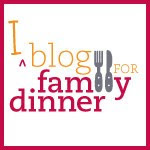 Special event dinners like Thanksgiving are a wonderful way to be connected to family and friends, but you can have that sense of connectedness throughout the year with regular family dinners. The act of sitting around the table itself may foster more gratitude among family members. According to new research by psychologists, being thankful can have positive influences on the lives of children and adults, mirroring many of the benefits of family dinner. Just think of banking a fraction of the energy you spend on Thanksgiving to share toward regular family meals. I hope that warm thoughts of Thanksgiving can spur new resolutions to make family dinner a routine part of your life. On that note, I am honored and grateful that eatdinner.org was mentioned in Jennifer's Grant recent column in The Chicago Tribune. Happy Thanksgiving from eatdinner.org!